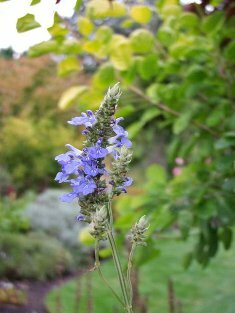 Joy Creek Photo Archive (c) all rights reserved A majestic salvia from S. America. Salvia uliginosa forms clumps that spread by underground stolons. Towering spikes of true blue light up the late summer garden. It likes a moist site. August to frost. 8 ft.